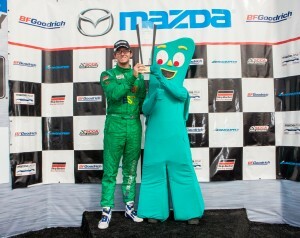 Glendora native Kenton Koch and pal Gumby were all smiles atop the podium at Mazda Raceway Laguna Seca in Monterey, California on May 3, 2014. 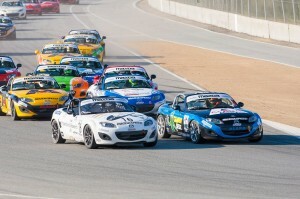 Koch, racing his Gumby Fest custom ALARA Mazda MX-5, celebrated a first place finish at his home track. “This weekend was a great weekend for Gumby! A win and a second place was just what we asked for,” said Koch. 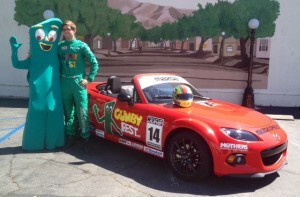 In addition to his Gumby racing car, Koch sported a custom Gumby Fest Mazda Motorsports Sparco racesuit and helmet, which he donated to the Glendora Library to be auctioned off in support of the library. This partnership grew out of Koch’s desire to give back to his hometown. He found creative ways to get involved by promoting Gendora’s inaugural Gumby Fest, June 14, which honored the city’s connection to Gumby. “A special thanks to L & G Enterprises for painting such a beautiful helmet. 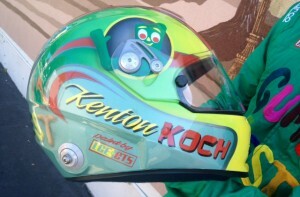 To whoever gets this piece of art, take care of it!” Koch remarked about the Gumby helmet. 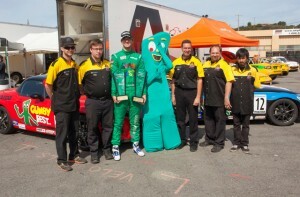 Kenton made appearances before and during Gumby Fest for photos ops with Gumby, Koch’s custom racecar, suit and helmet. The first-ever Gumby Fest honored Glendora’s connection to Gumby—the city was home to Gumby’s studios (Clokey Productions) in the 1960s and 1970s. Thousands turned out for the festivities, which included presentations by current and past Clokey Productions crew, film screenings, stop motion animation demonstrations, a “Gumby Museum” filled with memorabilia, food, music, and a wide array of games and activities for the kids.The planning team is looking forward to the second annual Gumby Fest in the summer of 2015. For more information on Gumby Fest, please visit www.gumbyfest.net. Learn about Gumby at www.gumby.com. Check out www.kentonkochracing.com to learn more about Kenton Koch.